It is never easy to do a perfect nail artwork. The liquid peel-off latex “Bliss Kiss” can take the stress down. 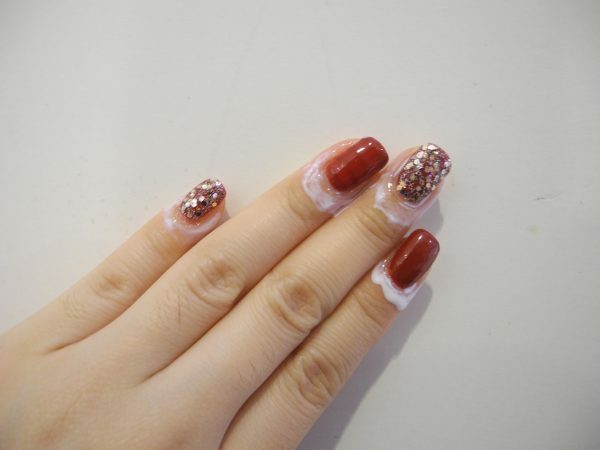 Just brush it on all around the nail and make sure they cover a big enough area. It dries off into a rubbery shield and ready to receive any overrun Polish. There you go! Polish mess can be eliminated in a swoosh! Liquid latex comes in handy especially for the application of glitter. On the other hand, glitter can be gloppy when applying with a brush. So one more little tips here. Try adding some glitter polish on a cosmetic sponge and dab it on the nail. It works much better!